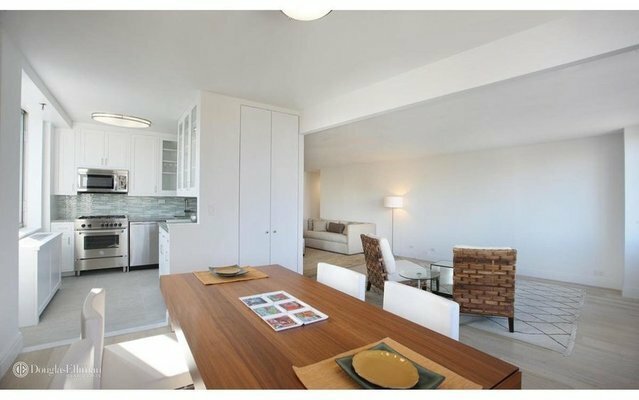 This north facing home has bright, open views and a large private terrace. This convertible two-bedroom has a large alcove in the living room that once converted becomes an 11Ãâ4 x 9Ãâ4 bedroom. A spacious floor plan makes this a wonderful home with pass thru kitchen with stainless steel appliances, custom cabinetry, and granite countertops. It is renovated with hardwood floors, a great layout, and large living space. The two bathrooms have imported Italian Carrera marble and tri-view medicine cabinets. Excellent storage space with six large closets including a huge walk in closet in the master bedroom. Amenities include 24-hour doorman and concierge, valet, on premise 24-hour parking garage, laundry on every floor. In addition, there is a penthouse-level amenity floor that includes a stunning landscaped and furnished roof terrace with Central Park and Hudson River views, fitness center, resident lounge, childrenÃâs playroom, party room and racquetball court, all in what is arguably the Upper West Side's best location.